A wonderful multipurpose gel in an easy to carry & use tube packing. 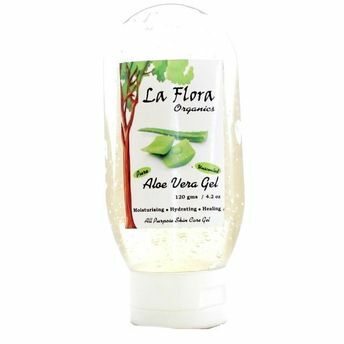 La Flora Organics Aloe Vera Gel is quick absorbent, non-greasy, it softens & nourishes your skin making it radiant and smooth naturally. Ideal for normal to oily skin. Vitamin E rich Aloe Vera helps to tighten skin pores, lightens blemishes & scars with regular use. Aloe vera helps to reduce wrinkles & fine lines, acne & pimples. Use it as a hair care gel to reduce dandruff and scalp irritation or as hair styling gel. Can be applied as an after shave gel, after waxing or any skin treatment.